Dinner! 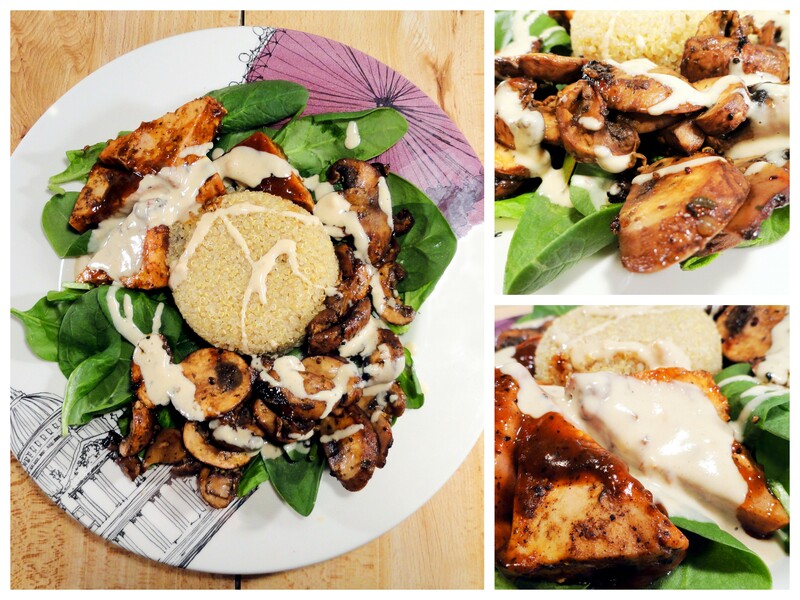 – Baby spinach, leftover quinoa, leftover jerk tofu, grilled mushrooms and a tahini miso sauce. To make the mushrooms, I marinated them in a mix of olive oil, red wine vinegar, balsamic vinegar, salt and pepper and various spices and let them sit for about 15 minutes. I then grilled them on my cast iron grill pan. The sauce consisted of about 2 parts tahini, to 1 part miso and 1 part lemon juice, whisked together and thinned with water. The tofu was pressed and then baked in the oven with jerk sauce. I bought a giant container of mushrooms from Costco the other day, so I anticipate mushrooms making their way into every meal for the next little while. 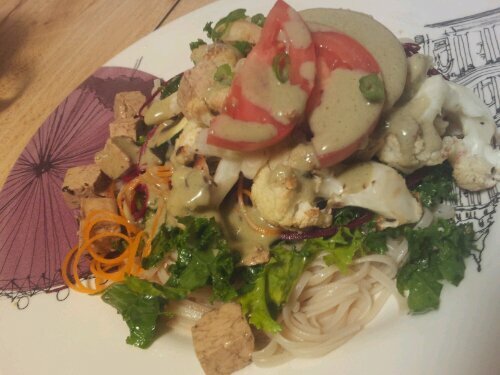 Dinner tonight was brown rice soba noodles, beet and carrot noodles, massaged kale, roasted cauliflower and zucchini, marinated tofu, some garlic chive sprouts and tomatoes with one of my favourite dressing recipes – Susan, of the Fat Free Vegan Kitchen’s version of goddess dressing. As usual, and possibly forever, I am in love with the grain bowl! Grilled veggies (eggplant, red pepper, portabello mushroom and roasted cauliflower) on lettuce with hemp hearts and tahini sauce. Yum! Have you ever made your own tahini sauce before? It is a really easy and delicious sauce. I usually do the usual clove of garlic, lots of tahini, lemon juice and water. I also add some pepper and hot sauce. Sometimes I get fancy and make it in the blender with parsley added in. 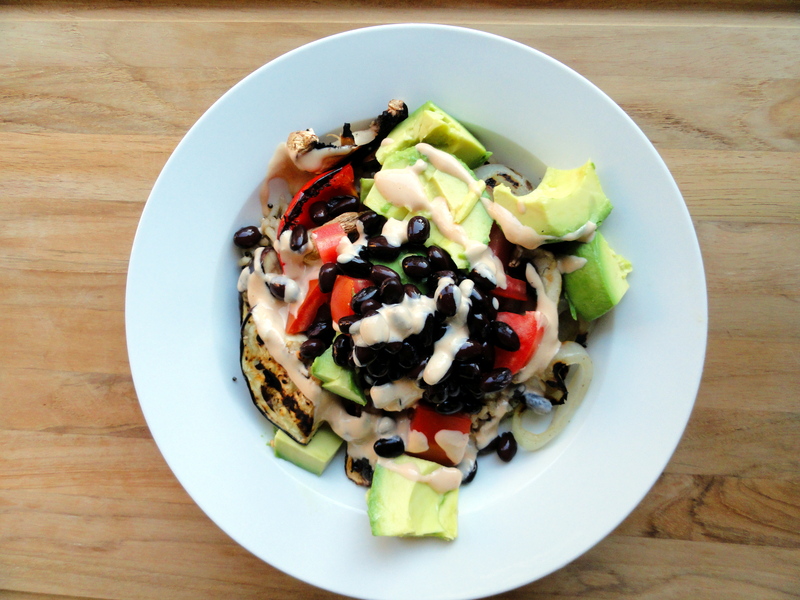 I’ve been eating this meal every day for about a week because it is quick and easy! Yesterday I had the veggies and tahini sauce over millet. What are you waiting for? Get your tahini on! It was really hard for me to get an appetizing picture of this dip. You will have to take my word for it that it is tasty. I didn’t find it too spicy, but if you aren’t a fan of a bit of spice, this might not be the dip for you. 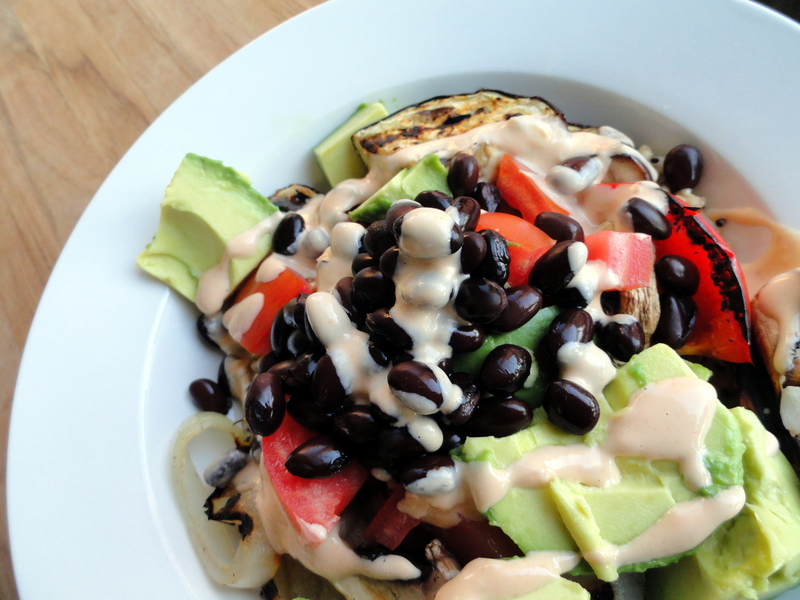 You could still make more of a hummus-like dip with the black beans if you left out the chipotle. I ate mine on a wrap with salad and grilled vegetables. Also, roasted cauliflower is awesome. I used this recipe, including the sauce (not pictured). Make it now! What are you waiting for? !